Hello Friends, looking for MARCOS Commando Salary, Allowances and Perks. In this article we have explained regarding the MARCOS commandos salary, benefits they get being a commando of Indian Navy. First will talk regarding what do MARCOS really do and how did they evolve? 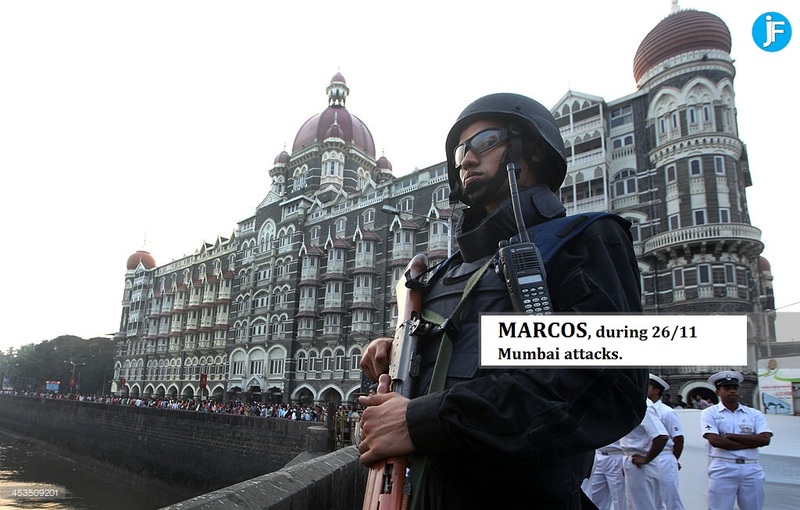 MARCOS is the short name for 'Marine Commandos'. Trained in HALO and HAHO, equipped with the best assault rifles, sniper rifles and real time war equipment, Indian MARCOS are one of the deadliest Special Forces in the world. 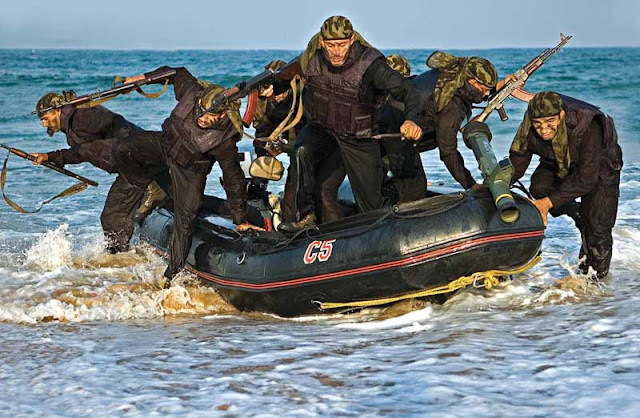 They are primarily trained along the pattern of the US Navy SEALs, with further training with the British SAS and compulsory training at CIJW (Guerrilla warfare) in Vairangte. MARCOS have also been known to carry out wide variety of operations in foreign soil. Very few know that MARCOS were utilized in the Kargil war for operations beyond Pakistani positions, the exact purpose of which remains classified. Currently the MARCOS are highly active in Jammu & Kashmir. Their main task is to prevent the infiltration of terrorists from Pakistan through Jhellum river and Wular lake. 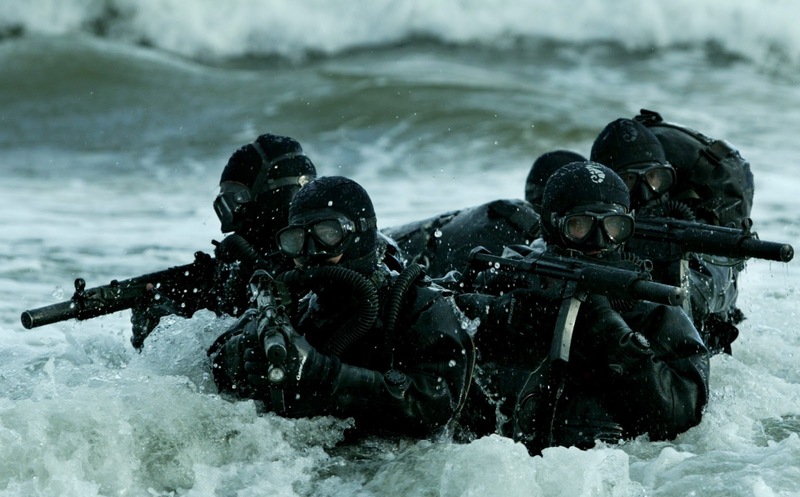 There are very few units in the world qualified to jump into water as well jump out of aircrafts with full combat load. The MARCOS can be deployed from Aircrafts, Ships and Submarines in full battle gear. The MARCOS alongside the Indian Army’s Para Commandos also use the most advanced and sophisticated weapon systems in entire Indian Armed Forces. Sub Lieutenant rank is the first rank given for the candidates at the Indian Navy who have successfully completed the prescribed training of Indian Navy for a year. Pay band or scale of an officer in the rank of Sub Lieutenant is 15600 - 39100 which lies in the pay band 3. Sub Lieutenant gets grade pay of 5400 rupees per month and Military Service Pay or MSP of six thousand rupees per month. Thus if total allowances and pay included an officer working in Indian Navy in the rank of Sub Lieutenant gets salary of around 65000 rupees per month. Lieutenant rank is the Second rank of Indian Navy officers. After two years of service as commissioned officer, an officer of Indian Navy gets rank of captain. An officer in the rank of lieutenant gets pay band or pay scale of 15600 - 39100 which lies in the pay band 3 of revised pay scale by sixth pay commission. A lieutenant receives 6100 rupees grade pay, 700 rupees more than that of a sub lieutenant. MSP of a lieutenant is 6000 rupees per month. 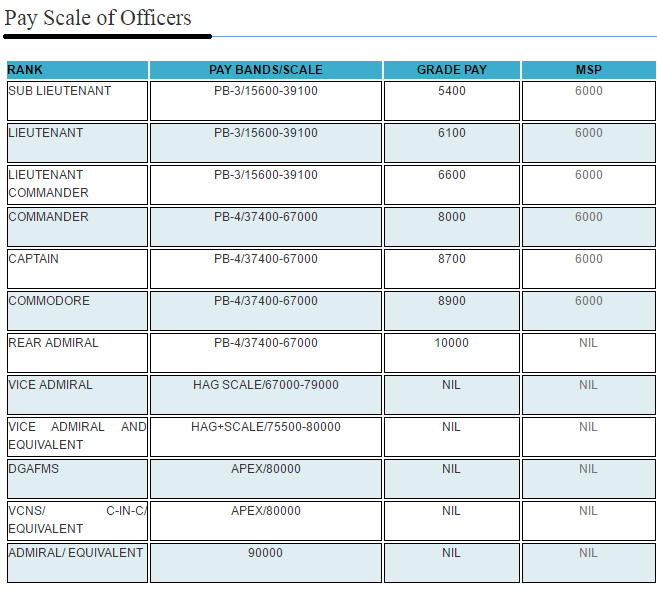 After Lieutenant rank, Lieutenant Commander rank is the third rank given to Indian Navy. A Lieutenant Commander of Indian Navy gets pay band or pay scale is 15600 - 39100. Apart from the pay band or pay scale, Lieutenant Commander receives 6600 rupees per month as grade pay. Also MSP of six thousand rupees per month is admissible for a Lieutenant Commander In general an Indian Navy officer serving in Lieutenant Commander rank gets around one lakh rupees per month. A Lieutenant Commander is appointed as a Commander after promotion. Pay band of Commander changes to pay band four and pay scale range changes to 37400-67000 rupees. Also an officer in the rank of Commander gets eight thousand rupees per month and six thousand rupees as MSP pay. All in all an officer of Indian Navy in the rank of Commander gets around two lakh rupees per month as payment. A Commander is promoted to the rank of Captain of Indian Navy gets pay band or pay scale of 37000-67000 rupees. An officer in the rank of Captain gets 8700 rupees grade pay and 6000 rupees as MSP monthly. Thus, a Captain of Indian Navy gets two and half lakh rupees to three lakh rupees per month. Commodore rank is given to the Indian navy officers who are serving in the rank of captain and considered for further promotion. A Commodore of Indian Navy has pay band or pay scale of 37400 - 67000 rupees. Also a Commodore receives 8900 rupees as grade pay and 6000 rupees as MSP monthly. So Indian Navy Commodore gets around three and half lakh rupees per month. A Commodore is promoted as Rear Admiral in Indian Navy. A Rear Admiral gets 37400 - 67000 rupees. Also an officer of Indian Navy in the rank of Rear Admiral gets ten thousand rupees per month as grade pay. A Rear Admiral of Indian Navy gets around four lakh rupees per month. Vice Admiral of Indian Navy gets pay band or pay scale of 67000 - 79000 rupees. Vice Admiral of Indian Navy does not get any grade pay or MSP. All in all an Indian Navy officer working in the rank of Vice Admiral gets around four and half lakh rupees. Admiral rank is the highest rank of Indian Navy. Admirals pay band is fixed at ninety thousand rupees per month. The Admiral of Indian Navy gets around more than six to seven lakh rupees per month. Cost to Company (CTC) : The CTC for a Sub Lieutenant would be approximately Rs. 77,750/- per month. This includes Basic Pay, DA, Grade Pay, Military Service Pay, House Rent Allowance and Transport allowance. These rates are subject to change as per 7th Pay Commission. Privileges : In addition to the CTC mentioned above, Navy provides free Medical Facilities for self & dependents, Canteen Facilities, Entitled Ration, Mess/Club/Sports Facilities, Furnished Govt. Accommodation, and Car/Housing Loan at subsidised rates. Pension with all benefits who retires. Group Insurance & Gratuity : Insurance cover of Rs. 50 lakhs (on contribution) and Gratuity will be granted to the officer as per the latest rules in force. Leave Entitlements : On Commission, officers are entitled to 60 days annual and 20 Days casual leave every year (subject to service exigencies). They are also entitled for 40% rail concession to any place and free travel (as per extant rules) for self and family. Leave during training period will be as per the Training Policy in force.Also their is Leave Encashment (upto 300 days). Sports & Adventure : The Navy provides facilities to pursue any sport of your liking. In addition, one can learn and participate in adventure sports, such as river rafting, mountaineering, hot air ballooning, hang gliding, wind surfing etc. Physical Fitness : In Naval Academy curriculum, a lot of emphasis is laid on physical fitness. You are therefore, advised to remain fit by undertaking regular physical exercise, sports, running, swimming, etc. so that you meet the training goals successfully. Sea Going (for all Officers Serving onboard Ships (sailing only) - 4200-5200/ PM On basis of rank. So this was all about MARCOS Commando Salary, Allowances and Perks. Hope you would have liked our article. This was generally the salary with the ranks of Indian navy. MARCOS commando salaries are generally kept confidential and its very hard to know the actual salary they get. Allowances and Perks also depends for which mission the commando is posted and has been on a mission. So salary of MARCOS commando, allowances and Perks this all things depends on their missions and their posted areas which is all decided by Central Government Of India. If you have any questions regarding MARCOS Commando Salary, Allowances and Perks feel free to share your comments in below comments.